Lots of Toronto Detours, as of late! By going to support hometown bands when they play the big city, it has been fun discovering new venues and expanding my knowledge of the T-dot. 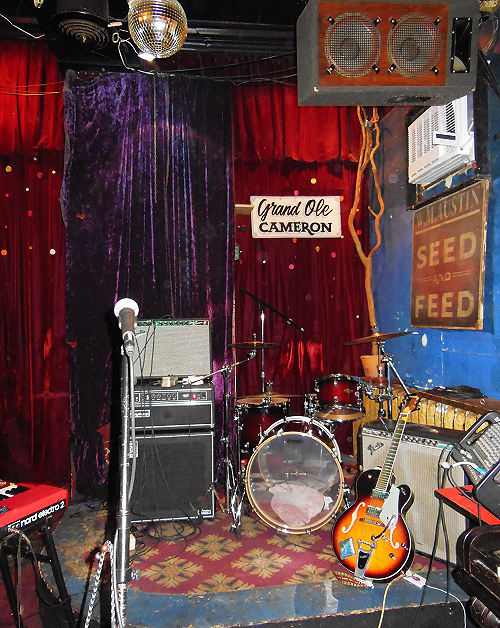 Harlan Pepper played a residency at The Cameron House – every Tuesday in June they took over the venue. With Toronto’s Queen Street West being right in my wheelhouse and four chances to go, I knew I had to make the trek. My friend Luisa and I made a day of it, especially since we were on a serious shopping hunt. The mission: summer dresses! We had no luck going from shop to shop most of the day. Getting frustrated, we took a rest stop at Hero Certified Burgers, like last time. After dinner, with about an hour before the show, we struck gold in a nearby shop. The first few dresses we grabbed were the winners! Feeling accomplished, we fancied a beverage. We discovered a little hole-in-the-wall bar on Spadina called Wide Open. The sign reading Tuesday’s special, $3 bottles of Amsterdam Blonde, drew us in. Can’t beat that! From there it was over to The Cameron House. It’s a very unique venue – theatrical with its red velvet curtains, rich colours, a little Spanish flair with the painted murals and ceiling, and a quintessential disco ball. Harlan Pepper played the front room, but there is a spacious back room that is also used for shows. We were early enough to greet the HP boys and watch them sound check. They said it was their sound check, but as it went on I almost didn’t believe them! They got into the groove and had a good jam session. Luisa turned to me, wide-eyed, “This is their sound check? !” You could have told us that was the show, and we would have been none the wiser. They’re that good. But after a quick wardrobe change, Harlan Pepper hit the stage for real and played two sets throughout the night. At the beginning of their second set, we got a real treat. The one and only Tom Wilson was in the audience and joined the boys for a couple songs. I hadn’t seen Thompson and his dad perform together before; it was very cool to see. I can’t say enough how much Dan, Thompson, Jimmy, and Marlon impress me. They’re so solid now but it will be amazing to watch these guys grow and get even better over time. Check out a clip in my video.